Everything from the host Lampros, the rest of the staff, the recommendations, the bed, the view, the breakfast in the morning, the hot tub, the location in Imerovigli (between Fira/Oia and much more peaceful than both), etc. Avista Suites made our honeymoon in Santorini as memorable as could be. If looking for the best possible experience you can have in Santorini, don't look any further! Our host Lampras is such an incredible human being. What a tremendous staff!! Breakfast was awesome, location was awesome, we not stay anywhere but here in Santorini. It will not disappoint!! The hosts were very welcoming, the suite was charming, and the views were spectacular! Great view of the island, particularly the sunset and the most exceptional service I have ever experienced in my life. The host makes you feel like you are his personal guest, goes above and beyond expectations to make your stay perfect. He helps you plan your trip, recommends restaurants, takes care of everything and you leave knowing you've made a new friend in Santorini. From the candles in the evening to the smoothies on the rooftop at sunset - every detail is perfect. The service provided by him and his team was the highlight of our family trip to Santorini. The room itself was amazing. The view was spectacular but most of all the service was impeccable. Best boutique hotel I have ever stayed in. Totally luxurious and spacious. The breakfast was also a huge plus. 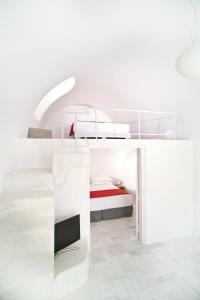 We have visited Avista Suites before and there is simply no better service or accommodation on Santorini. The fact that this is a three-suite property means guests are treated to 5-star service at all times. The location of the suites is superb with 360 degree views of the Caldera and surrounding village. The interior and exterior of the suites is first-class and incredibly beautiful. Lambros and John are perfect hosts and we can't wait to stay with them again in the years ahead. The hosts have a way of anticipating every need and wish. The best place we have stayed in the Greek islands. The hotel room was modern, beautiful and comfortable. It was quite hot in Santorini while we were there but the AC in the room worked great and it was always refreshing to return to our room after a long day in the sun. Our rooftop deck had amazing views and a private hot tub! The breakfast was delicious with hot fried eggs, toast, cakes and jams (there were more options but we tried to restrain ourselves). The mini bar prices were extremely reasonable and I enjoyed the access to free coffee and tea in the room. We got great recommendations on where to eat and what to do during our stay. Our favorite hotel during our 10 day trip in Greece! The host is very atentative and kind! He helped us pick out activities to do during our stay and regularly checked in to make sure that we were having a good time. The property itself is breathtaking. 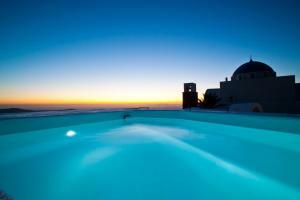 Best views in Santorini and the roof is the best place to watch the sunset. Our suite was beautiful and extremely comfortable. The breakfast was delicious. John, one of the workers continuously went out of his way for us. We asked him for directions to a restaurant and he happily walked us the entire way to the restaurant. He even surprised us with a glass of wine during the sunset. Only positive things to stay about our stay here :). The Avista Suites was absolutely phenomenal! Starting with check-in, Mr. Labros gave us each a glass of wine while he carefully explained Santorini and helped us plan our 6 days here. He recommended amazing restaurants and wineries and booked our sailing catamaran tour of the Island. He also arranged transfers for our various excursions. He, John, and the rest of the staff went out of their way to make sure we were happy and comfortable. The property was beautiful, set on the highest point of the Caldera. The private rooftop hot tub was the perfect place to watch the sunset. Fira was a short walk and Oia was a 15-min bus ride. The in-room massages were the best we've had anywhere. We will be back here on our next trip to Santorini! Lock in a great price for Avista Suites – rated 9.8 by recent guests! One of our top picks in Imerovigli – and a guest favorite. Perched on the cliffs of Imerovigli, Avista offers Cycladic-style suites in minimal decor overlooking the caldera and the volcano. A la carte breakfast is served in the room and free WiFi is available throughout. 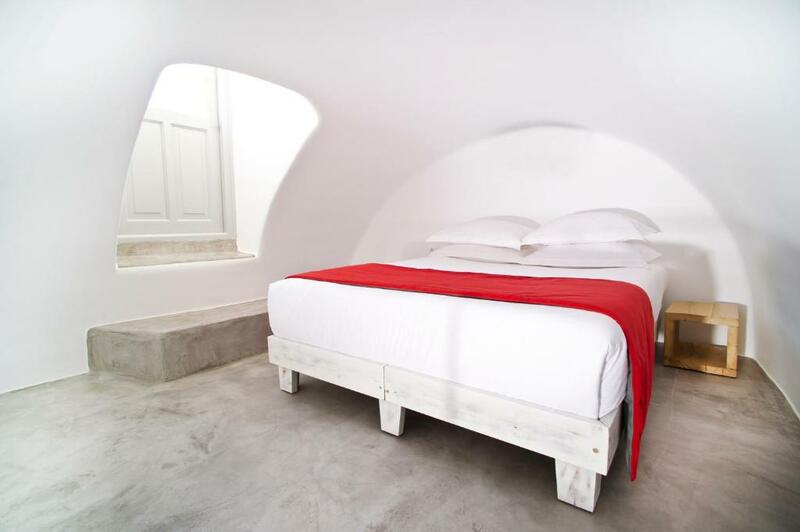 Avista Suites feature arched ceilings and white tones with red details. They come with a flat-screen, satellite TV, laptop safe and mini-bar. Mattresses are by Coco-Mat while there is also a pillow menu. In the bathrooms, you will find Korres toiletries, slippers and a hairdryer. Fira, the capital of Santorini with its many restaurants and bars, is only 0.9 mi away. Santorini Airport is 6.2 mi away, while the port of Athinios is at 9.9 mi. When would you like to stay at Avista Suites? Featuring a loft, this minimally decorated suite comes with a living room, flat-screen, satellite TV, bathrobes, free Korres toiletries and slippers. You can enjoy views over the caldera and the volcano from its rooftop terrace while relaxing in the private outdoor heated hot tub. Please note that this suite can accommodate a maximum of 2 adults. Featuring a private pool and a spacious rooftop with hot tub overlooking the caldera and the volcano, this minimally decorated suite comes with a flat-screen, satellite TV, spa bath, free toiletries and slippers. Avista Suites is a charming Boutique hotel consisted of 3 unique Suites, located in a pedestrian area at the highest point of the picturesque village of Imerovigli, right next to Malteza square. A unique property designed with respect to the local architecture and blended with minimal aesthetic and modern comforts. Mythical views of the caldera and sunset from your roof top terrace while you are relaxing in your personal hot tub. In a relaxed atmosphere blended with personal hospitality Avista Suites offers a memorable experience. Imerovigli is a traditional village located on the highest point of the part of Santorini facing the caldera, 380m. above the sea level. It is built according the traditional architecture and has some of the most characteristic churches of Santorini. Imerovigli offers great view to the natural rock formation called Skaros. House Rules Avista Suites takes special requests – add in the next step! Avista Suites accepts these cards and reserves the right to temporarily hold an amount prior to arrival. Please inform Avista Suites of your expected arrival time in advance. You can use the Special Requests box when booking, or contact the property directly using the contact details in your confirmation. The location of this property is excellent, close enough to everything but in a part that is fsr enough away from the hussle and bussle of the cruise ships and tourists. There are plenty of other excellent things too, the staff are brilliant - friendly and informative without being intrusive - and the breakfast is exceptional. Oh and the view at sundown isn't bad either. Don't expect much privacy, like the whole of Santorini the hotels are built on top of each other so you share your roof deck within 5 meters of the neighbouring property, but this honestly doesn't matter much and staying in a property like this more than makes up for it. Nothing. I can’t think of anything to dislike. The suite was phenomenal and the location could not have been better. The hotel host was gracious and so welcoming. There could not have been anything better about our accommodation or the host. Wow - what an Amazing experience! If you're staying in Santorini look no further, Avista Suites has it all. Great location, private, amazing personal service, beautiful suites, incredible views - perfect! Loved the location . Loved the view . Loved the sunsets. Loved the serenity . Loved the breakfasts. But most of all we loved the hosts , Labros and Gianni. We absolutely recommend this address for a successful stay in Santorini! Located in the heart of Imerovigli, on the highest point of the island, far from the crush of Oia or Fira, the view of the house is imprenanable on this beautiful place ! Lampros and Yannis are very caring for their customers, breakfasts are greedy and satiating, warm welcome, the house is particularly neat and concierge services perfect, we will return. Thank you for this stay which will remain forever engraved in our memories. Nancy and Willy. From day 1 Lampros, Jon and the staff at Avista were very welcoming and had our every interest in mind. Over the 2 nights we stayed at Avista not only was the accomodation, location and service amazing but Lampros went above and beyond to make sure we had a memorable experience and we honestly can not thank him enough. Will stay again 100%. My wife and I have recently returned from a 5 night trip at Avista suites and we were really sad to leave, I really cannot recommend this place enough! Lampros and John were absolutely fantastic, we arrived as guest and i felt we left as friends. We opted for a private transfer via email which was organised by Lampros (well worth it as there is only 39 taxis in santorini). We were meet at arrivals by our Our flight was delayed by an hour meaning we didnt arrive at Avista till 01:30, John greeted us and carried our luggage to our room where was greeted by Lampros who gave us a quick run down on things and tour of our cave house. The views from our roof terrace were simply breathtaking. We had a big hot tub that was built into the architecture which was perfect. Our breakfast was served every morning on the terrace, there is a menu to chose from, i think we sampled everything and quality never faultered. We had room 101 which was very clean and well presented. We hired a car through Lampros to see the island which i would reccomend and also a catamaran trip that was well worth the money. both the chaps recommended places to eat which were a hit. You really, really cannot go wrong here. The accomodation, location and sunset views are fantastic. Above all Lampros and John was the cherry on top. 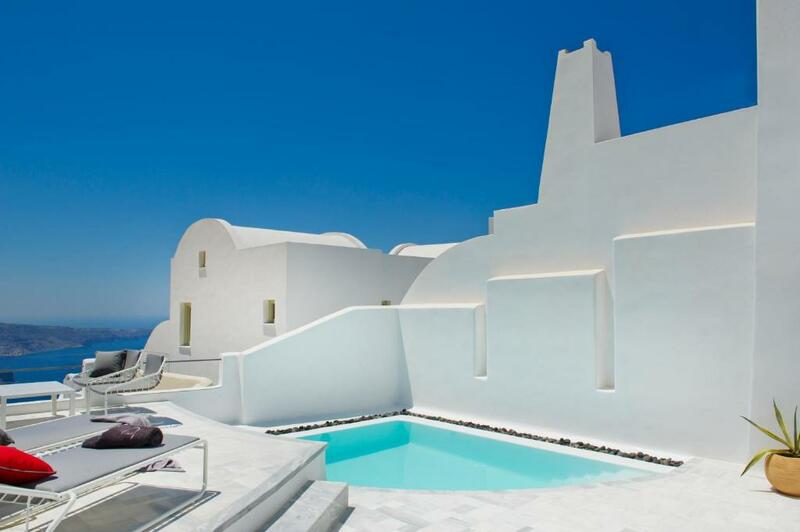 100% when we return to Santorini it will be at Avista suites. If you are looking for an ideal vacation, Avista Suites is the place for you. From the moment you arrive, until your departure,Lampros and John make sure that anything you need or want becomes available to you.The suite is gorgeous, immaculate and extremely comfortable.Breakfast was plentiful and delicious.Lampros is so helpful and knowledgeable about the island.His recommendations were fabulous for restaurants,activities on the water, outdoor cinema, car rentals, etc . The suites are in a convenient location and the sunsets from the suites are magnificent. The location is nice and quite with an amazing sunset view that can be seen from the roof terrace, staff were fantastic. Would recommend. Excellent service, the most gorgeous view on the island (been to Fira and Oia many times before). Very peaceful and beautiful. There is only one word that describes this place: Awesome. From our arrival to our departure everything was perfect. Thanks to Lampros and his staff for making our visit the best ever, and for giving us a memory for life.